As mentioned, despite the presence of various precursors, the history of modern fountain pen is traced back to the late 1800s, when first models began to be industrially produced and marketed on a large scale becoming usable and used in the everyday life. 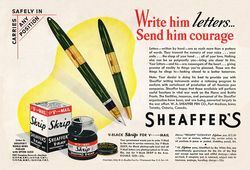 The historical period covered by this site and its various pages in it should therefore be referenced by these early days until the 60s, when industrial production of writing instruments focused primarily on the ballpoing, and the attention was focused on the creation of disposable pens at the lowest price possible. The following is a list (strictly in alphabetical order) of the main historical brands of fountain pens. 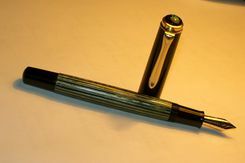 In recent years, driven by the return of attention to this writing instrument, there has been a flourishing of new companies, and also the "resurrection" of some historical brands that were closed long time ago, just to produce bad imitation of old models or pretentious luxury items with little value from technical or stylistical point of view. Here are listed only those brands which are between the main historical producers of fountain pens, and that were present on the market from before the '50s. To open a section on recent productions all interested people are invited to contribute. A more detailed list, with all minor brands and sub-brands can be found here. Scansione di una pubblicità Sheaffer del 1943 per un set penna/matita modello Triumph Tuckaway. Foto di una Pelikan 400 in colore verde.